If this is not terrorism, what else is? 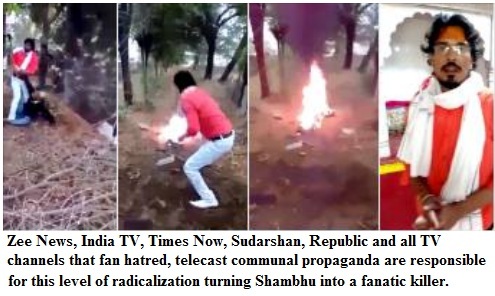 Shambhulal Raigar alias Shambhu Bhawani, a right-wing fanatic, hacked a Muslim man to death, poured kerosene on him and burnt him--an incident that has shocked the nation. He got the entire scene video-recorded (his own minor nephew was given the task) and seemed to have no compunction for the crime. The victim--Afrazul, 50, was a poor labourer from West Bengal. He was befriended by Shambhu, who took the former to a desolate spot and then attacked him before burning him alive. The incident occurred in Rajsamand in Rajasthan. 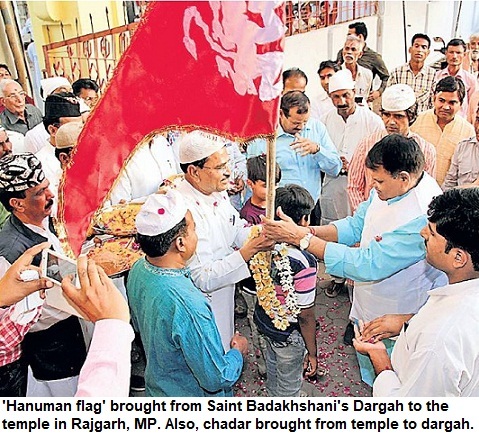 The state has witnessed several such crimes--ranging from Pahlu Khan's murder by cow vigilantes to the killing of Muslim folk singer Ahmad Khan. "Khan is survived by his wife, mother and three daughters. His family is struggling to deal with medical expenditure of his 80-year-old mother who has been bedridden with paralysis for one year", says this report in The Hindu. The initial reports of the horrific crime started coming from December 6. What was Afrazaul's fault? Nothing, except that he was a Muslim. The hate crime and the level of indoctrination of Raigar, which prompted him to kill the man with such brutality, shows the worrying level of hate in the country. Who had radicalized Shambhu Raigar? The initial probe suggested that Shambhu Raigar used to watch lot of videos on his mobile. The videos that peddled hate--talked about 'Love Jihad', a right-wing propaganda accusing Muslims of marrying Hindu girls. With mainstream TV channels showing inflammatory videos and propaganda day after day, the distrust between communities has grown. The tweet on the right (above) tells the state of Indian media. The largest circulated English daily in the world, Times of India, suggests as if Afrazul was involved in any love affair--though it was not the case. Shambhu had become a fanatic, watching this sort of propaganda and videos on phone. Propaganda is passed off as news on TV channels like Times Now, ZEE news, Sudarshan Channel, India TV and Republic. The owners of these channels, media houses--Vineet Jain to Subhash Chandra, they can't escape the blame. History will never forgive them for passing off propaganda as news and dividing Indian society on communal lines. A lie spoken a hundred times, becomes a truth. In India, the kind of hatred that is being fanned by the TV channels--both Hindi and English, apart from irresponsible print media, and the proliferation of social media where inflammatory messages are spread through Whatsapp and Facebook, has created this situation.